Nor and I recently had a little daytrip out to Milletts Farm, which is a sort of strange family-friendly theme-farm/garden centre/petting zoo near Frilford, Oxfordshire where Nor used to go as a kid. Apparently Herefordshire Cider is now a PGI (that is ‘Protected Geographical Indication’, like Champagne) product. And this is clearly aimed at the premium end of the market. Indeed it is a little pricey at about a fiver for a 750ml bottle. 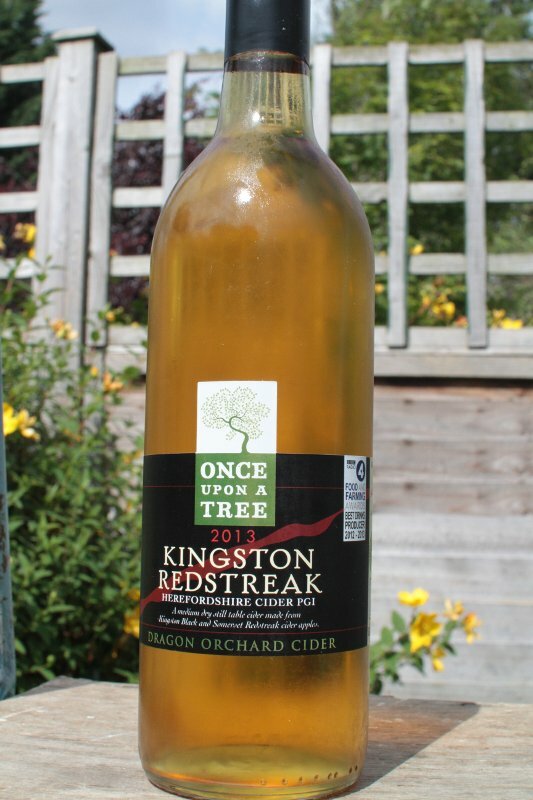 The bottle is clear glass with a screwtop and a pleasant enough label which mentions that Once upon a tree won Best Drinks Producer in Radio 4’s Food and Farming awards in 2012-2013. The cider is a deep reddish amber. Its flat with just a touch of carbonation when I pour. Kingston Black can be a pretty sharp apple, but this is nicely blended out with the bittersweet SomerSet redstreaks to make a nice rounded medium dry cider. It has a bit of a kick at 7% ABV. On the palate it starts out like a typical medium dry, but after that there is a bit of Kingston Black astringency, which develops into a mellow, slightly spicy aftertaste with a bit of acidity. Drinking a glass of this on a warm day was refreshing, but I think the full body and slightly spicy taste would be just as well suited to warming one up on a cold autumn evening.